Sadly, between the snow, ice and now the torrential rains, my ride time has been pretty minimal. I’m sure hoping that it changes soon as I am definitely spending too much time talking about my horse on the Internet and working so that I can pay for the horses I’m currently not riding! Experience the Maryland Hunt Cup! Talk about a “skinny” fence! Where the hell — pardon my french — is “feed horse”???? 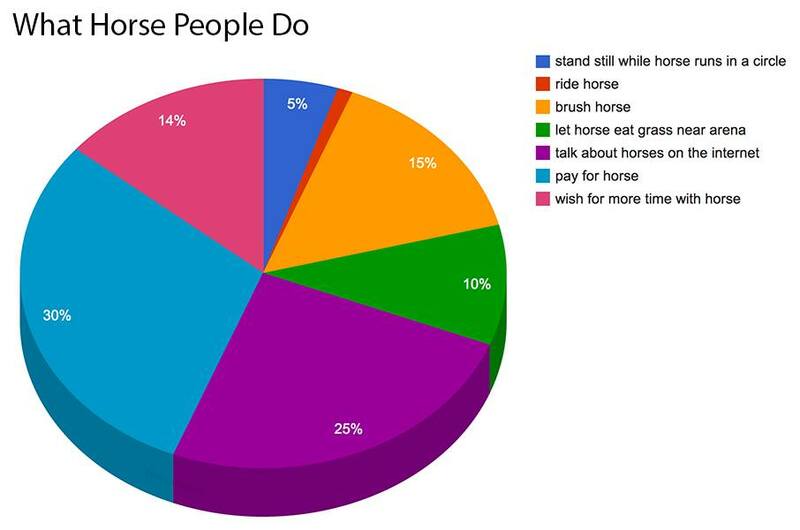 I believe that the chart was created by asking non horse people how they thought we spent our time. So it’s more perception than reality. Unfortunately, there’s a lot of truth to it, too! No disrespect intended and all. And thanks for the arena grass, but still. Wow. You ride? As in actually getting on said horse when done running around you in a circle, and eating grass, and you are not at work? Wait…I’m vaguely remembering the concept…oh yeah…there’s this stuff called “tack”, and we use it when we are on vacation? And we have more than five minutes? It’s all starting to come back….huh. I remember! “Tack” keeps the hair and mud off my jeans. Lol, thanks for the reminder!